1995 Grady White 208 Adventure. Same awesome Sea-V2 hull that's produced at The Grady White factory today. 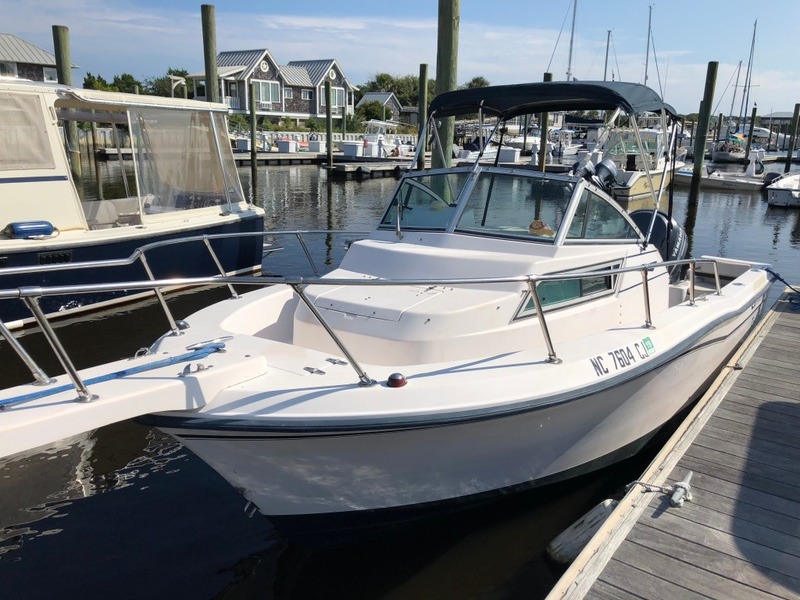 Used all year long fishing the Cape Fear River and site seeing the ICW, this 1995 Grady White 208 adventure comes with a 2003 Yamaha 225 4 stroke engine, aluminum tandem axle trailer. Just replaced all the hubs, bearings, and wheels and tires on the trailer. 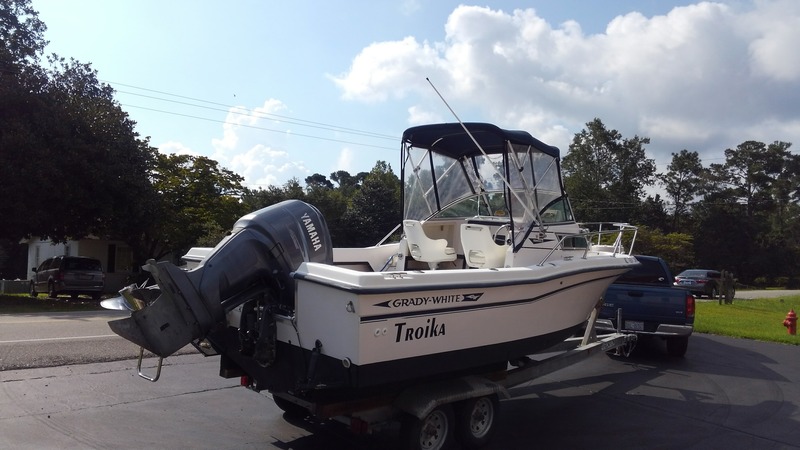 Accessories are Garmin GPS/ sonar, vhf radio with new antenna, compass, full canvas enclosure, trim tabs, bow pulpit, swim ladder, stainless steel prop. $11,500. Local pick up only but will deliver within 50 mile radius of Southport NC. The trailer has NO title. Perfect boat for families with young children. It's like a playpen on the water with the high cockpit gunnells, walk around cabin and cozy napping in the cuddy. All updated wiring, switches, instrumentation. Updated cuddy cabin cushions to current Grady White fabrics and foam. Garmin GPS/Fishfinder and VHF radio neatly flush mounted. Cockpit drain scuppers in the transom have been raised to accomodate the extra weight of the bulletproof Yamaha 225 Four-Stroke. Updated factory Grady White hull decals all around. 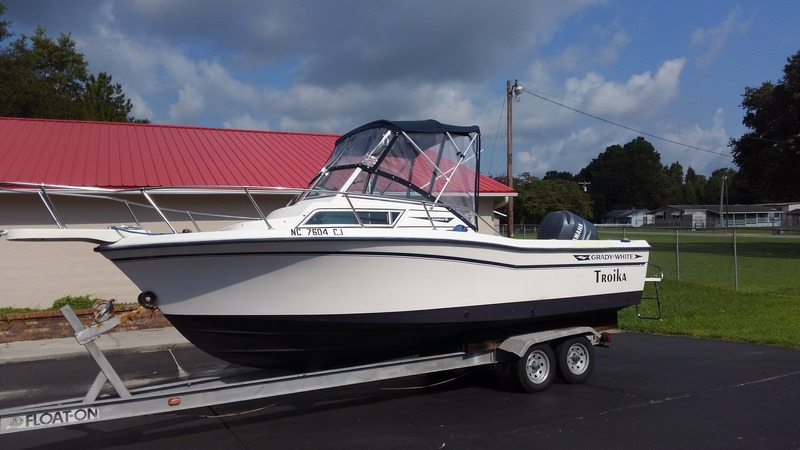 Boat is extremely well maintained and cared for. Runs like a top. Starts instantly every time. Grady-White’s heritage and expertise in the design of 20-foot walkaround cabin boats began over 40 years ago with the company’s pioneering 204C Overnighter. The Adventure 208 brings the full measure of walkaround style and a SeaV2 ride to today’s boat market. Secure platform for fishing and all kinds of water fun.